Natural Bridge Caverns was first explored by four students from St. Mary’s University in San Antonio. After several expeditions, the students felt a cool draft and found two miles of passages that make up the caverns. The landowners at the time decided to develop the first half mile and open it up to the public. It is one of the largest caverns within the state of Texas. There are several cavern tours, but the most popular is the Discovery Tour. Before you enter into this abyss of the earth, you’ll pass by the breathtaking 60-foot limestone bridge that gives the caverns their name. Once you head into the caverns, you’ll travel about 180-feet below ground. The tour takes you through three quarters of a mile of cavern and takes about 75 minutes. Once you finish the tour, you can partake in some of the other activities on property, such as Canopy Challenge and AMAZEn’ Ranch Roundup. There are longer and more intensive tours you can check out, as well. Inner Space Caverns was discovered in the spring of 1963 by some unfortunate Texas Highway Department core drilling team members when their bit dropped 26-feet below the ground. They ended up drilling through 40-feet of solid limestone to get into the caverns. Spelunkers started exploring the caves in late 1963 and the caverns opened to the public in 1966. These caverns are the closest to Austin on this list. The classic tour is called the Adventure Tour and departs every 20 to 30 minutes. It lasts up to 75-minutes and takes you on a paved, lit trail through the largest and most decorated rooms in the caverns. Inner Space Caverns offers two other cavern tours that will delight any spelunker out there. Located on almost 650-acres of Hill Country just south of Burnet, Longhorn Cavern State Park is another cave I recommend checking out. It was discovered in the mid-1800s by settlers who ended up mining bat guano to manufacture gunpowder during the Civil War. Wild legends were spread about the caverns and they began attracting tourists. By the 1920s, the main room became a dance hall and concert venue (aka the speakeasy of the century). The state ended up acquiring the caves between 1932 and 1937, eventually opening to the public in 1938. The walking tour takes you through 1.5-miles of cavern, where you’ll explore 11 highlights such as Crystal City, the Underground Ballroom, and the Hall of Diamonds. This tour lasts a bit longer than some of the others, finishing in about 90 minutes, but it’s definitely worth it. Visit the historic CCC Observation Tower once you finish up, and maybe even spy on Falkenstein Castle nearby! You can also hit some of the surrounding trails to enjoy the gorgeous natural life in the area. Take a day trip to Sonora in west Texas and visit the Caverns of Sonora. It’s a bit of a drive (three and a half hours), but you won’t regret it one bit. Caverns of Sonora was discovered by the Mayfield family in the early 1920s when their dog chased a raccoon into a 20-inch opening in the rocks on their ranch. Locals began exploring the cave, only going back about 500-feet from the entrance to a room with a 50-foot deep pit. Additional passages were eventually discovered by cavers in 1955. By this time, human impact began to show damage in the caves and development started in 1959 to preserve the natural formations. The location opened to the public in the summer of 1960. The classic tour of the Caverns of Sonora is the Crystal Palace Tour. It lasts about one hour and 45 minutes, taking you down 155-feet below the surface, through a couple miles of gorgeously decorated passages. The highlight is a Natural Butterfly formation–the cave’s trademark. You’ll find it’s not complete, though, as the formation was sadly vandalized in November 2006. It’s still beautiful, though! My next cavern trip is going to be to Cave Without a Name out in Boerne, Texas. These caverns were discovered in 1927 when a goat fell through a hole into the caves. After exploration and development, the cave opened for public tours in 1939. It also offered a showroom. The cavern name came from a young boy who claimed it was too beautiful to have a name. The cavern tour starts with guests descending into the cave through a sinkhole opening, down 126 steps to about 80-feet below the surface. The tour lasts about one hour and takes you through six rooms with gorgeous cave formations. If you decide to turn this day trip into an overnight stay, check out a musical performance and stay onsite at the camping and RV grounds! Wear appropriate shoes. Closed-toed with a solid grip, so you can make it through any steep, wet pathways. All of the caves are between 66 to 72 degrees Fahrenheit year-round with high humidity (like 98 percent). Dress accordingly. Critters are few and far between, but don’t touch any if you stumble upon them. Don’t take anything from the cave! Destroying or defacing a cave in Texas is a felony. 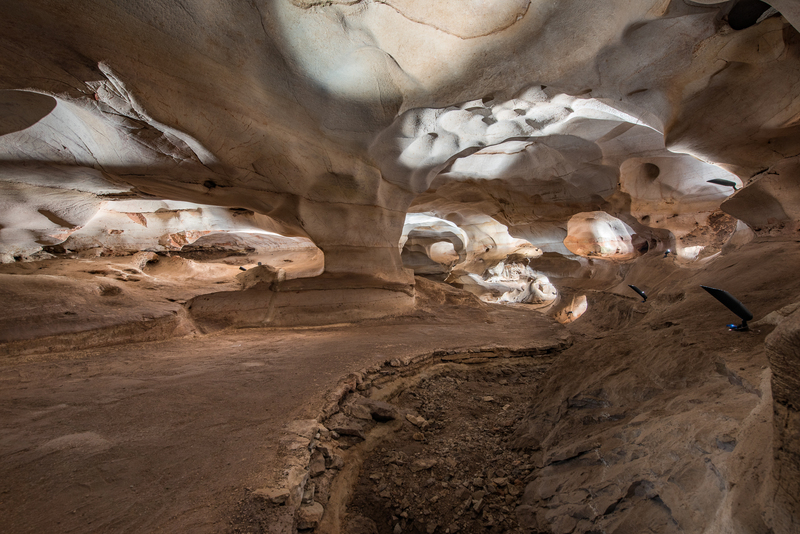 Four of these caverns are a part of Texas Cave Trail, a program where you fill up a passport to trade in for a free t-shirt once you’ve gone to all of the locations. Which of these caverns near Austin have you explored?